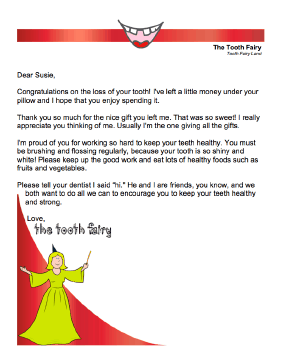 Some children like to leave little gifts for the Tooth Fairy, and this letter thanks the child for it. Congratulations on the loss of your tooth! I've left a little money under your pillow and I hope that you enjoy spending it. Thank you so much for the nice gift you left me. That was so sweet! I really appreciate you thinking of me. Usually I'm the one giving all the gifts. I'm proud of you for working so hard to keep your teeth healthy. You must be brushing and flossing regularly, because your tooth is so shiny and white! Please keep up the good work and eat lots of healthy foods such as fruits and vegetables. Please tell your dentist I said "hi." He and I are friends, you know, and we both want to do all we can to encourage you to keep your teeth healthy and strong.